AHEPA, the American Hellenic Progressive Association, was founded in Atlanta, GA in 1922 as a response to attacks on Greek immigrants and businesses by the KKK. Once the early 20th Century waves of anti-immigrant violence started to abate, AHEPA remained as an important social and fraternal organization for Greek Americans, and continues to operate to this day on an international scale. As of this writing (Feb 2013) they list a total of 27 Districts that encompass the United States, Canada, Greece, and Cyprus, as well as mentioning a presence in Australasia. Incidentally, the fez is as much associated with Greece as it is with the Islamic Mediterranean, although probably coming from the same Ottoman source. The Greek iteration is usually a lower, closer, more rounded affair, rather than the high, straight architectonic shape that we typically envision. (Incidentally, the soft, somewhat battered fraternal fez as it was originally worn in the late 19th/early 20th C was closer in form to the “Greek” fez!) The Tsolias, the ceremonial guard of the President of Greece, still wears a fez as part of their extravagant uniforms. 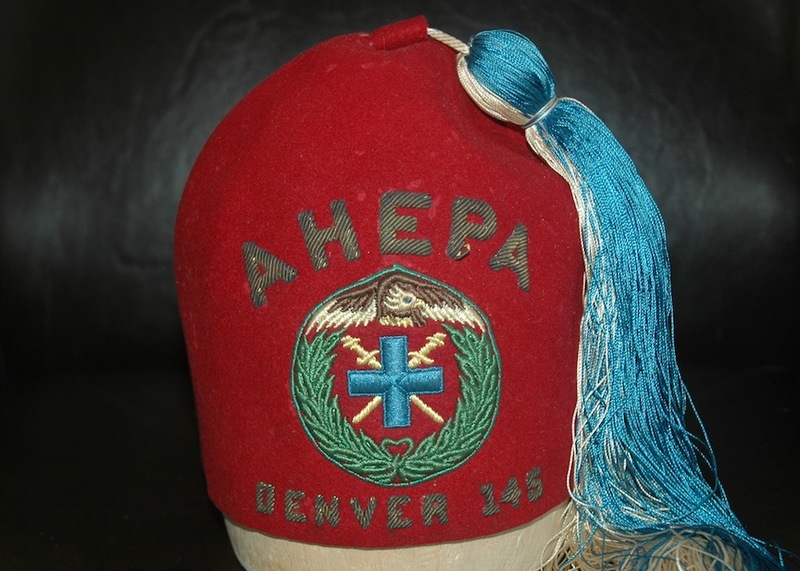 AHEPA fezzes, notwithstanding, have followed the same trends of form as other American fraternal fezzes, going from softer and rounder to more upright, large, and formal over the decades. Red felt, white and blue tassel. District Governor’s fez, for years 1962-1963, District 6 (NY State). Embroidered emblem of the association shows grey bird carrying blue Greek cross, crossed swords behind, encircled by laurel wreath of victory. Blue and white tassel is held to band simply by a string. 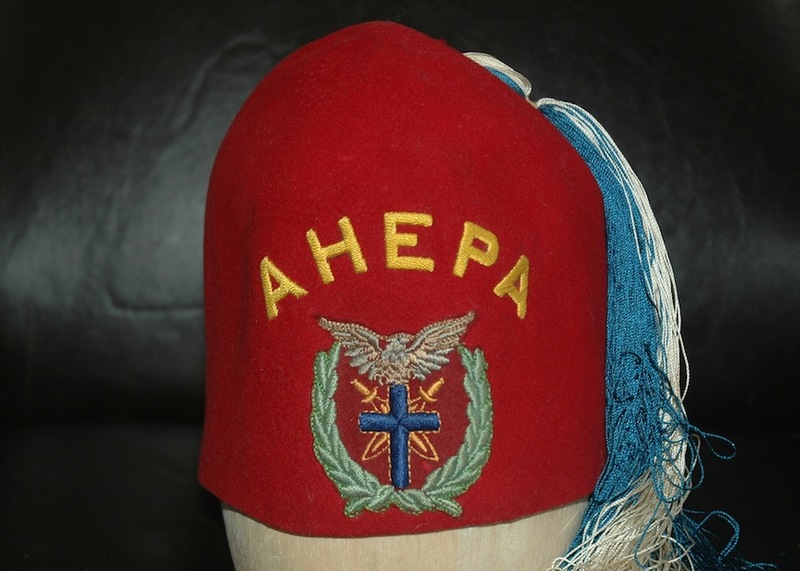 Red AHEPA (American Hellenic Educational Progressive Association) fez with blue and white tassel. Emblem is high-quality embroidered patch, with bullion lettering above and below, which reads AHEPA (above) and DENVER 145 below. Emblem consists of an olive branch wreath encircling a blue Greek Cross, behind which are crossed swords, and an eagle above with wings spread. From the Denver Chapter. Bullion on the lower tip of the P of AHEPA is damaged/pulled. At one time the fez had a sweat band, but it is now gone, although considerable associated accretions remain, as well as some stray stitching around very edge of felt. Rough date based on (missing) sweat band and no venting on top. Red AHEPA (American Hellenic Educational Progressive Association) fez with blue and white tassel. Emblem is high-quality embroidered patch, with embroidered lettering above which reads AHEPA. Emblem consists of an olive branch wreath encircling a blue Latin Cross, behind which are crossed swords, and an eagle above with wings spread. The Latin rather than Greek cross is extremely unusual on the AHEPA hat. Whether this denotes an incidental design change, or if it perhaps was at some point used as an ecumenical option for non-Orthodox members, I am unable to tell. Queries to current AHEPA members on the issue has stumped them, as well. Sweat band is extant but badly degenerated and crumbling. Light (sewing pattern?) paper rolled up and stuffed behind to shrink sizing of the hat may have contributed to the poor state of the band. Vented in top. I found one of these in San Francisco, Haight and Ashbury. Wanted to pick it up. Excellent condition.